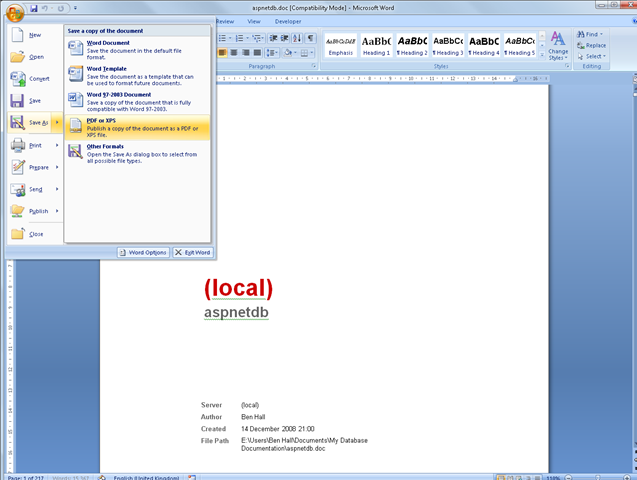 In my previous post I explained how you can use SQL Doc 2.0 to document ASPNetDB and produce a Microsoft Word document. 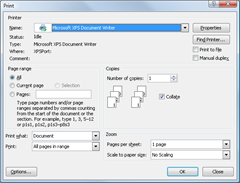 One huge advantage of having it in Microsoft Word is that it can be exported to a number of different formats very easily – for example PDF or XPS. To do this from Word 2007, the first step is to download the Word 2007 Save as PDF XPS addin from here – http://www.microsoft.com/downloads/details.aspx?FamilyID=4d951911-3e7e-4ae6-b059-a2e79ed87041&displaylang=en. After installing this you will have a new option within your Save As menu. After producing your database documentation as a Document, simple select this option to save the document. 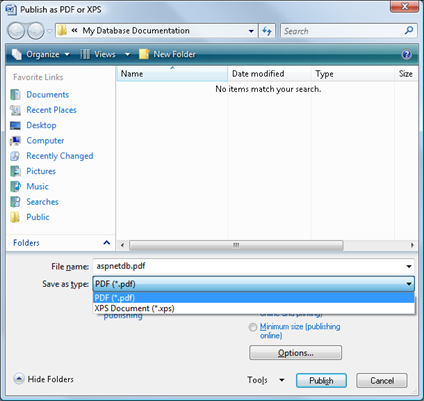 It will ask you where you wish to save the document and the format it should be saved as. You can select between PDF, or Microsoft’s XPS Document – both work exactly perfectly, it’s just personal choice. This is how the XPS document looks within IE8, which you can download here. 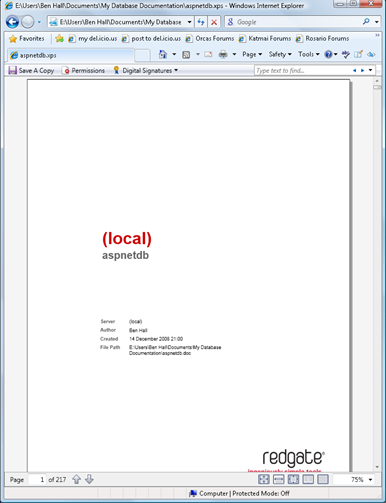 The document looks exactly the same as the original word output, however it can now be shared in different formats. However, if you don’t have Office 2007, all is not lost. There is a free download available called CutePDF Writer where you can print any document or file as a PDF – very useful to have installed. By selecting this as your printer, it will create you a PDF document which you can then use as you wish. 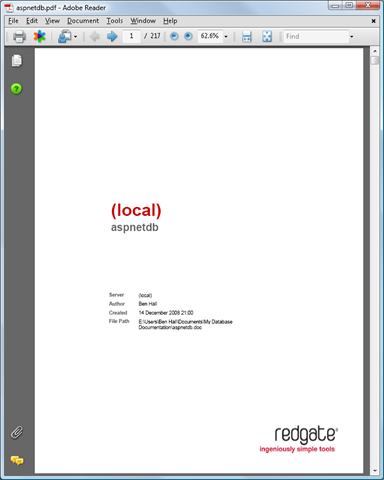 For those of you with .Net 3.0 framework installed, there is an XPS Document Writer installed, which is very similar to CutePDF. 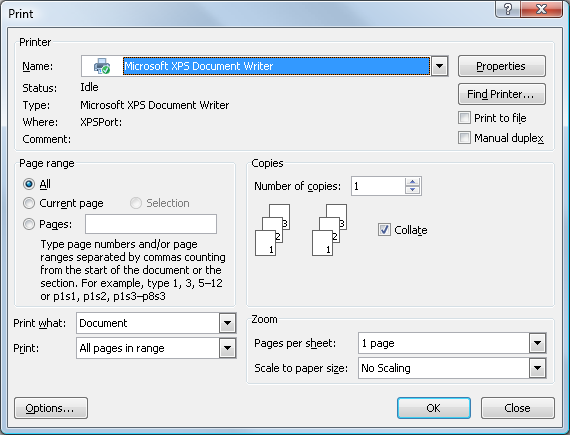 This will create you XPS documents in exactly the same way.